"This book is a real tour de force and an important addition to a currently relatively small body of writings on climate change from a psychoanalytic perspective. It is comprehensive and encyclopaedic, covering enormous ground between related and complex disciplines and theoretically dense concepts... Dodds navigates these ideas with clarity and conviction. Overall, he demonstrates the need to link the various different approaches in order to address the ecological crisis that we face. I think, the book is essential reading for all and will add specifically to their understanding for those studying psychoanalysis, psychotherapy and systemic thinking." 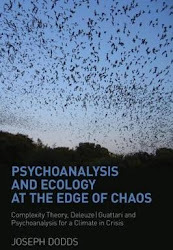 - Jan Baker, Psychodynamic Practice: Individuals, Groups and Organisations, Psychoanalysis and ecology at the edge of chaos: complexity theory, Deleuze/Guattari and psychoanalysis for a climate in crisis, October 29, 2013, DOI: 10.1080/14753634.2013.853484. See here for other reviews. Prodigy Oil and Gas are the bast company for investing your money in petroleum industry .